I absolutely love having fresh flowers at home. What I do not love is breaking the bank for a beautiful arrangement! 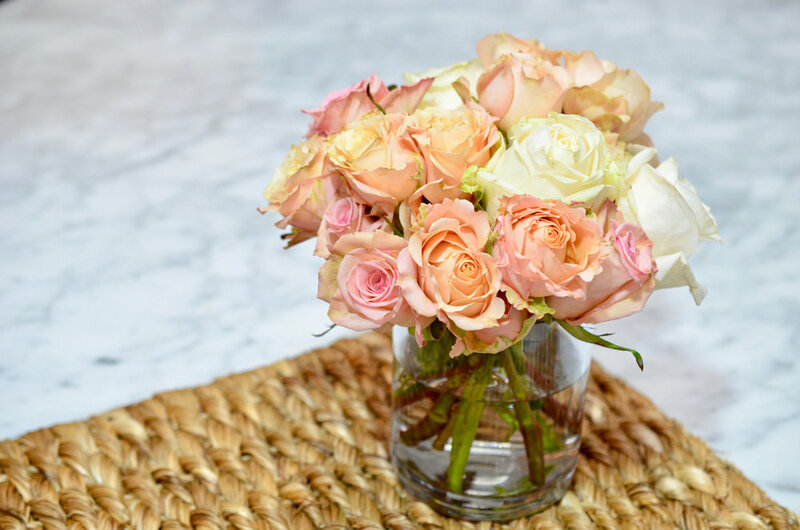 It is entirely possible to assemble gorgeous floral moments with blooms from your favorite grocery store, and I want to show you how to make a classic rose cluster using roses that I bought from my neighborhood grocer! For this cluster, I chose a similar color palette and three colors of roses: Pale pink with lime green, ivory, and a soft pink/peach. One of the varieties was a spray rose to add a different size and texture. All you need are flower shears, green floral wire, and a simple glass cylinder (my go-to vessel - they are easy to find, blend into any table setting, and are small enough to arrange multiples down the center of a table, place on a side table, etc.). This is the perfect time to be creative! If you prefer a monochromatic story, as I have shown here, select blooms that are in a similar color palette. For a more daring arrangement, shake it up a bit and choose a variety of hues for an eclectic centerpiece. Happy arranging! For a table setting, I think flowers should not be taller than 8-10 inches. Measure your arrangement using my technique in the video. Cut stems at a diagonal when arranging. I like to change the water and re-cut the stems daily to ensure my flowers stay fresh. To me, there is nothing more uplifting than a house full of flowers! They add a touch of warmth and natural beauty to any space and also make a house feel like a lived-in home. As I sit here typing this post, the weather has changed 269 times today: sunny, rainy, partly sunny and mist, grey, grey and rainy… well you get the picture. Not only did I need extra cups of my Earl Grey tea today (with cream, honey, and lavender sugar), I also needed a pop of color to make my apartment feel alive! Instead of shopping at a high-end florist for my weekly blooms (though I do get inspired there, too), my go-to “supplier” is my local grocery store. Lately the store’s floral department has been bursting with flowers in all shapes, sizes, and colors. With a little time (mere minutes really! ), a few supplies, and about $15.00 you can outfit your home with custom flower arrangements done to the perfect scale for any room in which you want a little extra pizazz! These beautiful yellow roses, tulips, and mums were left over from my coffee table arrangement. I decided to use my nan’s vase for added color and contrast. The “filler” greens from the bouquet of roses look completely chic in a simple glass bottle set atop a silver tray and other bobbles. The most universal flower arrangement that can be used in any space are the low-lying tight flower clusters that you see in design magazines, high-end boutiques, hotels, and chic restaurants (also currently making an appearance on my coffee table!). This type of arrangement is made by clustering flowers of the same color palette (or different, whatever fits your decor) in a simple glass vase. The key: a floral grid to hold each bloom in place. The grids are a simple “add on” to any vessel that can hold water, therefore making anything from a teacup, to silver bowl, to decoupaged coffee can a chic vase. Start by taking strips of floral tape and adhering them in straight rows (leaving about 1/4″-inch). For larger stemmed flowers, allow more space between each row. Next, repeat the same process in the opposite direction. Lastly, trim the excess floral tape with a sharp knife or razor blade.